Check out this collection of easy construction paper crafts for kids of all ages. These ideas can be combined & are fun to make individually or in a group. Keeping kids entertained is always an art form, whether it’s during the dog days of summer or the dreary doldrums of winter. Therefore we’ve collected a range of easy construction paper crafts for kids- with an occasional cereal box or a paper plate thrown in for good measure – that are appropriate for all ages. These are terrific fun to make in a group as part of a birthday party or picnic, or one-on-one at home with your child. Be prepared for some wonderful surprises – you may think you’re making dinosaur hats, only to be informed that actually you have made dragon hats! Quite of few of these crafts can be re-tooled and re-imagined or even put together for an entire day’s worth of activities. For example, combine the castle, crowns and dragon/dinosaur crafts and then put on a medieval play. Or make “ice” paper and marbled paper, then use the paper to create paper flowers. To make it easier to choose the right activities for your child, we’ve ordered these by difficulty. That said, with your help and supervision, even the littlest of little ones can work through most of these construction paper crafts and have a wonderful time doing it. Just keep a close eye out for any unnecessarily creative use of scissors, staplers or glue! You can beat the boredom with “Frozen” Ice paintings. These are incredibly easy and almost mess-free – two magic words in our house. The kids will be amazed as the “ice” actually “freezes” right in front of their eyes. Learn all the steps here. Simple, whimsical and adorable – all you need is construction paper, poster board, scissors, glue and the downloadable template. Kids love making really imaginative cats from this as well as realistic ones, so let them create cats with patterned coats, lots of tails or legs, or even pipe cleaner whiskers. Find instructions and the template here. So fun, so easy, so many possibilities! Recycle empty cereal boxes into monsters with a few supplies and a lot of imagination. This is a particularly good craft for boys as well as girls. Learn more at Crafts By Amanda. There are infinite possibilities for creativity in this craft. Consider making an entire menagerie, then using them for plays and stories. Check out this video for inspiration. Sorry but the pun must be said: these are a hoot! Use recycled toilet paper rolls to make the basic shape; all the details are up to your child. Bring together a wide range of markers, craft supplies, and construction paper to let them create some magical birds. Find out how at Education.com. You don’t need special paint to make your own chalkboards. Use dark construction paper, a paintbrush (foam is best), some chalk and glue instead. All it takes is covering the paper lightly in glue, then “seasoning” it with some chalk. Learn more here. Use your paper in something like the Kirigami Water Blossoms below. Details at Arts Smarts 4 Kids. Kirigami is very similar to origami, except you cut as well as fold the paper. You know those snowflakes children make by folding and cutting? That’s kirigami at work. There are so many possible shapes to create, but these water blossoms are lovely as well as relatively straightforward. Find out how with this tutorial. These look delicious and are guaranteed to never melt in the sun. Combine brown cardstock with tissue paper, then get creative for your toppings! Red buttons or pompoms make terrific cherries. See the details here. Make an entire sweet shop out of paper! Use this paper cupcake tutorial to get started, then try adapting it to make cakes, pies and more. Find out how at Wonder How To. An all-time classic and always a favorite around the 4th of July. It’s a little more complicated, but will be great for teaching your child about everything from geometry to wind power. Then, take your pinwheels out for a picnic and fireworks! This tutorial walks you through it. Make holidays like New Year’s Eve and July 4th last a little longer (but with less noise) by creating a few fireworks on paper. Pipe cleaners, glitter and glue are all you need. Use the pipe cleaners to make a firework “stamp.” After you’re done making the paintings, cover the 3-D pipe cleaner firework in glitter and you have a sculpture as well! Follow along with these directions. Practically anything your child loves can be made into a mobile. Just choose royalty-free clip art, or even their own cut-outs. The trick is to create both a standard image and a mirror image so you can glue them together. Lots of software is out there to help you; if you decide to use your child’s own artwork, just scan it in and run the program. Learn more here. With a little tissue paper and some help cutting and gluing, even the littlest artist can make “stained glass.” These are really beautiful crafts that look delightful in the sun. You can create the “frame” with either construction paper or even an embroidery hoop for more durability. All the details are at PBS. This project has a similar feel to the stained glass, and makes great use of paper scraps from other projects. The entire tutorial will walk you through making the mosaic and then turning it into a decorative plaque. Check it out over here. Painting with bubbles is hugely fun and a great outdoor craft activity. Come to think of it, this one would be almost as much of a good time at an adult picnic as a child’s party! You don’t even need actual bubble liquid – any dish soap will do the trick. See how at Activity Village. This project requires a little more dexterity – plan to either help the little ones, or give this craft to slightly older children. Pre-cut the paper strips and everyone can then just focus on learning how to weave. Check out the tutorial here. These are extra-special if you take the time to find some customized color paper and use that over a single-colored sheet. Or, paint any paper at all for something truly unique – try a watercolor effect! Check out Instructables for the full scoop. Truly, you can make any flower with paint, paper plates and some tissue and/or construction paper. Sunflowers are a terrific place to start, then let the kids branch out (apologies yet again for the puns…) and get creative. This tutorial shows you how. Got heat? Got crayons? Usually, what you have at that point is a mess! Instead, use the heat and any old broken crayons to make something fun and memorable with your kids. Once the crayons have sat out on construction paper in the sun for 20 or 30 minutes, they are perfectly pliable and can be spread into amazing shapes. The Clumsy Crafter has the full tutorial. This is brilliant, though perhaps better suited to older children or if you’re willing to do a lot of patient guiding. However, for the artistically/architecturally inclined, leaning to create a 3-D cube from 2-D paper could be just the beginning. Imagine….entire towns and cities based on this (relatively) simple paper cube! Find out how over here. Got a prince or princess, king, or queen in your house? They need a crown! Putting the basic crown together is beyond easy – gather loads of sequins, “gems,” glitter, tissue paper and ribbons for decorating. Learn how at First Palette. This variation is for the woodland folk – you can use fall leaves, or summer petals attached to the same basic crown shape. Handmade Charlotte gives all the details. This is an all-time favorite. Using nothing but construction paper (and tape/glue/scissors) your favorite budding paleontologist can create cute (or terrifying!) dinosaur headgear. Really go for it with adding a long trailing “tail” down your child’s back so they can roam the earth in full dino-style. Find the tutorial at Cutting Tiny Bites. Flying kites is a spring and summer classic activity. Let your child get even more out of it by building their own kite. Even younger children can get involved in decorating and flying! With this craft, you have a chance to teach a little history as well as make a personalized bit of decoration for your child’s room. Show the kids the old 18th century silhouette portraits, then make ones of your child’s profile. When the light shines through – magic! This tutorial will tell you the steps. Like the Paper Cube, this is a little trickier and may require either more mature kids or lots of adult interaction. 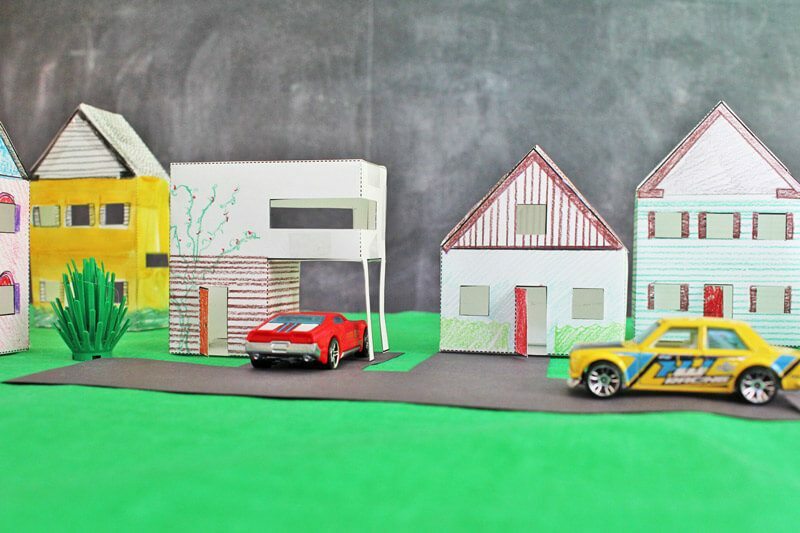 Use the Paper Houses template provided, be careful with the X-Acto knife, and make an entire village. Babble Dabble Do has the tutorial. This. Is So. Cool. Make a cylinder with construction paper, and moments later take it to the moon. The design is easy to customize by adding in portholes, fins, wings… whatever you and your child want! Another wonderful way to recycle standard household items! You can use either paper or foam egg cartons, then add sails and masts with construction paper and pipe cleaners or Popsicle sticks. Lego or clothespin people love to take these sailing (at least briefly) in the tub or wading pool. Learn how at Life At The Zoo. A great craft any time of year, this is especially appropriate around Chinese New Year. Have fun decorating your lanterns with things like gift wrap, glitter and sequins. You can also use ribbon or lace to make the handle, or to add streamers at the bottom. First Palette walks you through it. This actually looks far more complicated than it is – and it looks spectacular. Use recycled milk or juice cartons, toilet paper rolls and whatever other architecturally-inspirational material you have around the house to create a spook-tacular castle. Or, just make a fab medieval castle and break out those crowns! Learn all the steps over here. Every family has their own favorite crafts as well, frequently ones that were passed down from parent to child, or teacher to child. 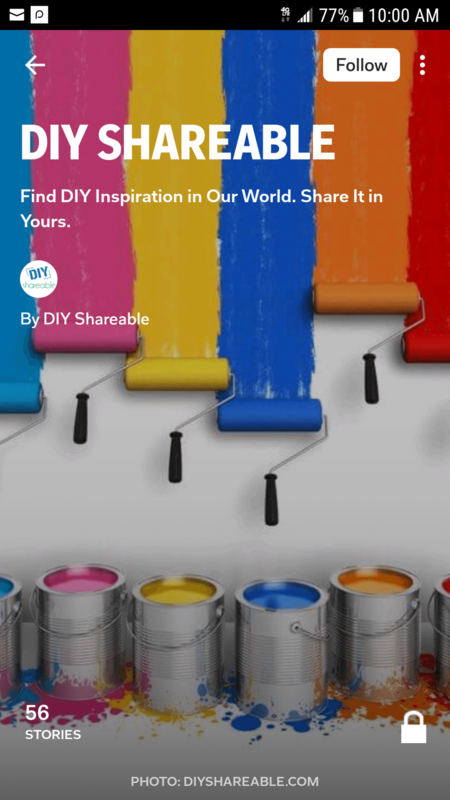 We’d love to hear about your best, most creative and entertaining crafts. Please let us know in the comments what keeps you (and your kids) entertained all year long. Here’s hoping you and your children have a wonderful time filled with laughter, fun and memories! Do Larger Tiles Tend to Make a Small Room Appear Big?